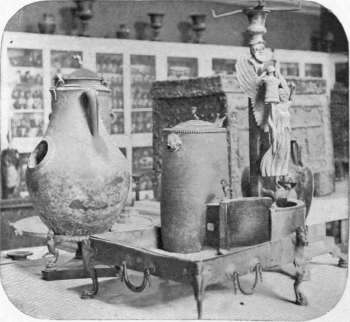 In a wineshop we saw the frames for the amphorae, or jars, all of which bore the marks of the name and quality of the liquor, as well as the year of its vintage, and which were found exactly where they had been placed by hands which have been dust for nearly two thousand years. Upon the counter, also, is a circular stain, left by the cup of one who may have quaffed here his last draught of wine made from the luscious grapes that grew on Mount Vesuvius. Close by this shop is a bakery, in the brick oven of which were found some carbonized loaves of bread that, no doubt, had been prepared for sale the evening of the city's overthrow. Upon the outer walls of many of these buildings have been discovered notices, painted in red letters, urging the citizens to elect certain men to municipal offices. One of them reads as follows: "The carpenters recommend Marcellus for the post of AEdile." 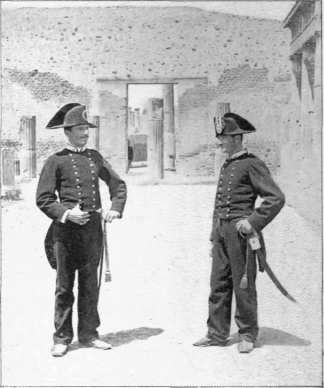 Is it possible then that Pompeii, also, had its Knights of Labor and its Walking Delegates? Perhaps Vesuvius did not do so bad a thing after all. Another interesting mural souvenir of the buried city is the Greek alphabet rudely scratched upon the side of a house. The youthful student must have been a little fellow, for his hand formed the letters only about three feet above the ground. 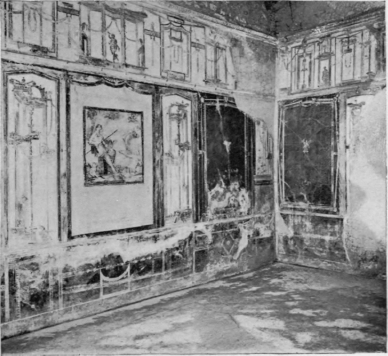 Two other walls are marked, respectively, with short quotations from Virgil and from Ovid, possibly written by children on their way to school. 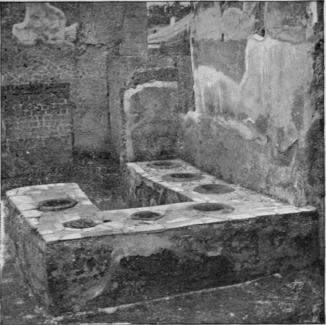 The fascination of Pompeii appeals to every one. The Arch of Constantine, the columns of the Forum, and the temples at Paestum appeal particularly only to the archaeologist and scholar; but there is a pathetic, human realism in the excavated streets and buildings of thoughtless tourist upon practically the same ground. Most of the world's great architectural monuments, that by their massive strength have managed to survive the ravages of barbarism and the wrecks of time, are structures which their builders planned to last for centuries. Hence, while they call forth admiration, they stimulate the intellect alone, and never touch the heart. 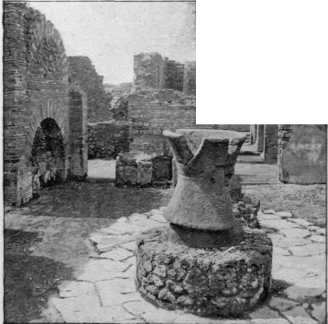 Pompeii, on the contrary, has a power to excite emotions such as no other city of antiquity can evoke, since it reveals to us in its minute details a life which, although separated from us by a gap of centuries, is not essentially different from our own. The objects found here are in one sense trivial, but they suggest the every-day existence of the human race. 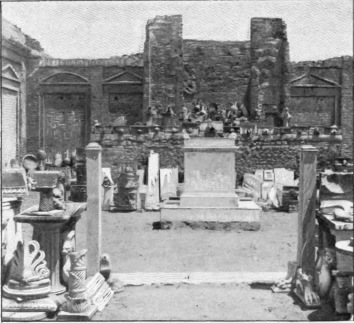 The tables spread with food, the loaves of bread in the oven, the advertisements of theatrical entertainments, the instruments of toil, and articles of personal adornment bring us immediately in sympathetic contact with the occupations, joys, and sorrows of the men and women of Pompeii, and thus enable us easily to put ourselves in their places, and see how we should probably have lived and loved, said prayers to Isis and amused ourselves in the amphitheatre, had we been in their place on that bright and cloudless day when the terrific action of Vesuvius suddenly transformed this gay, noisy city into a silent sepulchre, and Pompeii that moves the peasant no less deeply than the prince, and places the historian and the rolled a lava tombstone over it, there to remain for eighteen hundred years. 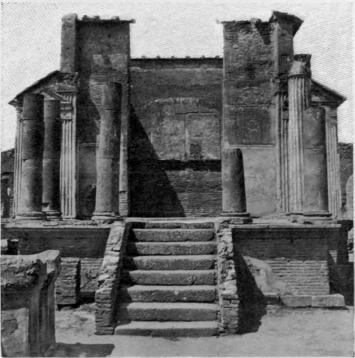 The Pompeian temple of Isis, although small, must have been very beautiful; for its remaining columns are still richly colored, and its walls were formerly covered with fine frescos. The marble altar in the centre seems waiting, even now, for its former fragrant offerings of incense; but no more worshipers will ever come to it while Time endures. Pompeii has awakened from her sleep of centuries to find her old religion superseded, her temples ruined, and her gods dethroned. The most pathetic fact connected with this shrine of Isis is the finding of a number of skeletons within its private sanctuary, accessible only to the priests, proving that some unhappy people had dared at last to enter even that most hallowed area, hoping Isis would at least spread over this, her special home, a mantle of protection. How miserably they must have died, while the light failed them steadily and surely, and, as they prayed in the stifling atmosphere, their voices grew fainter one by one, and finally were hushed in death ! They probably met their fate, believing that the awful night, predicted by their poets, had at last arrived, when the world and the gods were to be destroyed together.